BXP88 makes adding detection and transponding to your layout easier than ever. 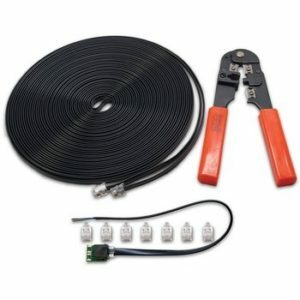 No more complicated wiring! DCC Occupancy Detection supports up to 8 Detection Sections letting you know when equipped rolling stock is in a detection section on your layout. One Transponding Zone per Detection Section lets you know the location of transponder-equipped locos or rolling stock. Intelligent Automatic short-circuit and over-current power management for each Detection Section, improves reliability by avoiding most booster fault shutdowns. Connects to LocoNet to transmit Detection Section occupancy, Transponding and track power information. Detects any powered locomotives in a Detection Section. Identify where specific rolling stock is on your layout with Digitrax transponder-equipped locos and rolling stock. Detects rolling stock equipped with resistor wheel sets. 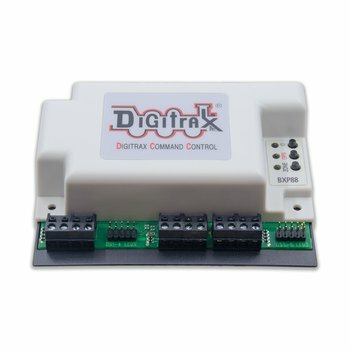 Plug and Play with Digitrax DCC systems with automatic Railsync polarity detection. LED output headers for front panel indication of Detection Section occupancy, Transponding, and power status. 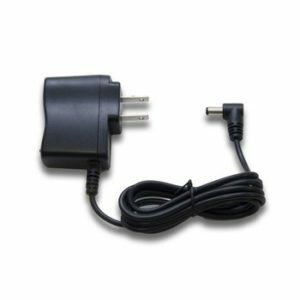 Easy-connect pluggable track wire terminal blocks can plug-in straight or at right angles. 3 Amp capacity per Detection Section , 8 Amp total unit capacity. Automatically updates status at track power on. Operations Mode Read Back allows you to read CV values of decoders equipped with transponders when on track. Firmware update capability via IPL over LocoNet.